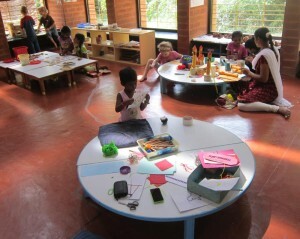 In the Auroville Kindergarten we have a progressive approach to education and it is based on integral education. The Kindergarten has 4 groups of children of about 15 kids in each, from 2 and half to 7 years old. For each group is a main teacher and an assistant. The teachers come from different countries and the cultural mix of children is even more varied. They are mainly children of Aurovilians, but the languages spoken may range from Tamil to Russian, French to Hindi. The common language for all these groups, and the language of instruction, is English. The purpose of education in Auroville is, in the words of Sri Aurobindo, to help the growing soul draw out the best in itself. It is student centered; experiences are carefully constructed to be appropriate for the child’s development and educative. 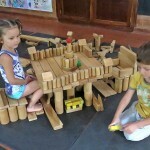 The whole child is addressed, there are many opportunities for choice but not to licence and children learn from an active engagement with the environment. We also emphasize the observation, concentration and the development of the sensory and body awareness, the cultivation of all the five domains of the being (physical, mental, vital, psychic and spiritual) and we take special care to the psychic climate of the school.